I once took a Segway tour around Angel Island, a beautiful hilly state park in San Francisco, just across the water from Belvedere. The Segway was super-responsive, powerful and once I’d learned to trust in it, a joy to ride. I immediately wanted one to use back home around Wellington. Then I learned how much they cost – well over$10,000. I didn’t think much more about Segways, occasionally seeing them around Wellington, mainly on the sideline at Westpac Stadium as the Sky TV cameramen adapted them for use keeping up with the action during rugby games. The price never dropped – new Segways sell for $14,000 – $16,000. As such, they are mainly used for security patrols, promotional events and recreational tours. In recent years we have seen the rise of the self-balancing scooter, or hoverboard, which is effectively two pads which you place your feet on, connected to two motorized wheels. They range in price from $30 to $400 and don’t have a great reputation for quality as the market has been flooded with inferior hoverboards – some of which had faulty batteries that exploded leading airlines to ban them from their aircraft. Into this market comes Segway, with more sophisticated versions of the hoverboard that cost $1,000 – $2,000, have the Segway badge of quality. The Segway Mini-Lite is mainly aimed at kids and teenagers and can accommodate people up to 80kg in weight. That made me slightly overweight for the device, but I gave it a go anyway, promising myself to take things slowly. The key thing to remember about the Segway, is to trust in its ability to stabilise itself – and therefore keep you upright. This seems initially counter-intuitive. You are basically standing on a hovering platform with no hand supports (the key difference with the full-sized Segway which has a controller stick you can hold onto. the mimi-Lite has just two pads on which to place your feet and a narrow stick that is topped with a pad between your knees between that you use to steer – leaning slightly on the pad to the left sends to you the left, and so on. Once you’ve stepped onto the Segway’s pads, doing so for the first time by holding someone’s hands, you notice the Segway adjusting for your weight, keeping perfectly stable. Then you’ll spend the next 15 minutes or so figuring out how to lean forward to gain momentum, lean back to brake and nudge that controlled stick between you legs to steer. in the first few minutes you will probably want to step off. It doesn’t feel natural and you expect the Segway to fly out from under you leaving you crashing to the ground. But again, if you trust in it and focus simply on getting a feel for the Segway, you will rapidly be rewarded. Within 20 minutes of first mounting it, I was doing figure 8 loops in my apartment block’s car park. Feeling confident, I took the Segway up to the Pukeahu National War Memorial Park near my apartment. It is all flat surfaces and sweeping stone boulevards – perfect for breaking in a Segway. I traded an amused nod with the guy who was testing out his new Phantom drone and began sweeping arcs in front of the red stones of the ANZAC memorial. Ten minutes later, I was zooming down the hill towards Taranaki St, spinning around and zooming back up. The Mimi-Lite can handle a 15 degree incline, something I learned when I came to grief trying to tackle the road up to the old museum. The Segway slowed and whirred as it tried to stay steady, forcing me to step off. Initially, the Segway will speed limit itself to 10km/h, but after an initial learning phase you can remove that giving you a maximum speed of 16km/h. It is tempting to lean in and really build up speed, but the Segway actually does a good job of keep you safe – approach that speed limit too quickly and it will first start beeping, then move to slow you by bringing the board flat. I never ended up feeling like I was going too fast but was able to get up a good cruising speed around Wellington’s Oriental Bay, where the wide, smooth walkway is perfect for Segways. The Mini-Lite has 10.5 inch tyres which handle footpaths, smooth road surfaces and wooden boardwalks well. I’ve used it on tightly trimmed grass without issue, though I’d recommend avoiding uneven surfaces, loose dirt or gravel, where the Segway can loose traction and spin abruptly forcing you to quickly dismount. The two powerful in-wheel hub motors have 700W of power between them – and do a great job of propelling you along at a comfortable pace and allowing tight manoeuvring around obstacles and rapid braking. You’ll get a maximum range of 18km on a single charge and recharging the battery will take around 3 hours. There are lights on the front and rear of the Mini-Lite that will let people know when you brake or move left or right. The front-facing LEDs also act as headlights throwing out enough light to illuminate the ground in front. The Segway smartphone app is an essential accompaniment to the Segway. 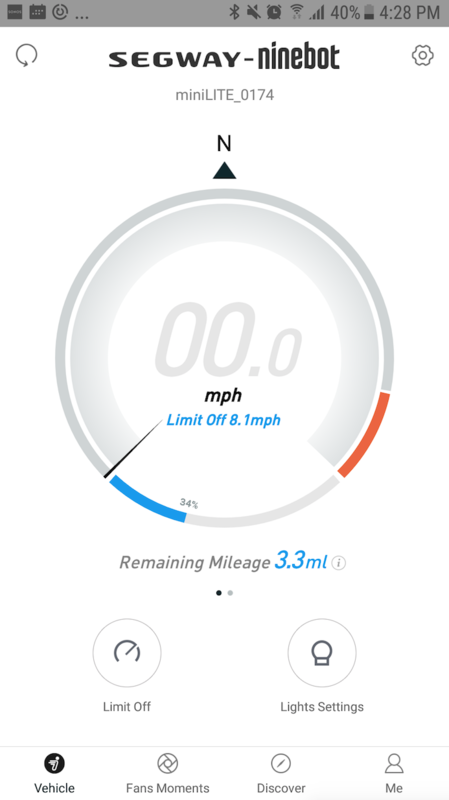 It acts as your speedometer and odometer and lets you adjust the light settings, disable the speed limiter and check the Segway’s battery status. I’ve ridden the Segway Mini-Lite from my home in the centre of Wellington along the waterfront to Thorndon where I work, a distance of of 3.5km. It took around 15 minutes each way and didn’t require a recharge in between. As such, it is an ideal commuting device for me. After a few days of use, I’m highly proficient and confident on the Segway Mini-Lite. Having said that, there are times when you simply have to step off the Segway, turn it off, pick it up and carry it over a stretch of terrain. The Segway does not like speed humps – I nearly fell off trying to mount one. It doesn’t particularly like uneven footpaths and it is best to avoid riding over debris or plastic bags that may cause the wheels to slip. You quickly become used to scanning the terrain in front of you for hazards. Initially, waiting at lights to cross streets was nerve-wracking, but now I know what the Segway is capable of and the golden rule that always gets me out of trouble – just lean back slightly to apply the brake and regain stability. There was one case where that rule was thwarted – riding in Wellington’s notorious wind. Riding into a headwind is fine – you are leaning forward and the motors give you the momentum you need. But with a tail wind, leaning back to slow down can be tough. Overall it really is quite remarkable how stable, easy to use and responsive the Segway Mini-Lite is. Kids will love it – I know this from the reactions I’ve received around town. But it isn’t a device for performing tricks on, like a skateboard. It is ideal for cruising around town – if you city has good walkways and reasonably flat terrain, the Segway is perfect. This feels like a safe device, unlike some of the hoverboards that have come onto the market. A friend fell off one of them and was badly concussed after hitting his head on the concrete floor. I’d recommend always wearing a helmet when riding the Segway or any other hoverboard. The 80kg weight limit for the Mini-Lite means it won’t be suitable for many adults, in which case you’ll want to consider the Segway MiniPro, which can carry a passenger weighing up to 100kg. There’s also the MiniPlus which has greater range, a maximum speed of 20km/h and a mode that lets it follow you when you have stepped off it. Segway has taken a crucial step down market with these personal transporters putting much of the functionality of the full-size models in the hands of consumers at an affordable price. Sounds fun, would love to try one. 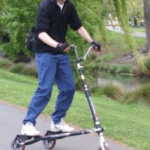 I ride a Trikke Pon-e light… also stand on electric, but with handlebars. I wonder if the 700W motors mean the segway min-lite is not legal on NZ footpaths (unless the law has changed, I think the limit was ~300 or 250 W). The price is very good, especially given the cost of batteries.